Yerba Buena Center is an 87-acre project, formerly an area of dilapidated hotels, commercial and industrial buildings and open parking lots. The project is located adjacent to the San Francisco downtown office and retail districts and includes the George Moscone Convention Center. It extends from Market Street on the north to Harrison Street on the south and from Second Street on the east to the west property line along Fourth Street. The project plan was adopted April 25, l966 and though the project was halted for several years in the 70's by a series of lawsuits, it is now in the final stages of completion. It is estimated that the remaining portions of the project will be completed by 2006. New housing in the Yerba Buena Center Redevelopment Project Area provides residences for people of all incomes including low, moderate and market-rate rental and condominium units. There are over 2,500 new housing units in Yerba Buena, and more than 1,400 of them are for low to moderate-income residents. 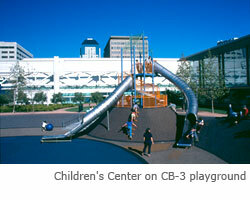 There are three "Central Blocks" within Yerba Buena Center, which comprise 22 acres. The uses for these blocks now include a three major hotels, 6 acres of gardens, retail, recreational, amusement, entertainment, parking, cultural facilities and a five-acre children's center. These uses were endorsed by decision-makers and set forth in a Master Plan and an agreement in December 1984 with the master developer, Olympia & York, Marriott & Beverly Willis, (YBG, LTD). The first phase, the 1,500-room Marriott Hotel, was completed in the Fall of 1989. YBG, LTD's option was terminated in February 1993 when they were unable to proceed. In November 1986, the voters approved the expansion of the Moscone Convention Center to add 330,000 square feet of exhibition space under Central Block 2 and meeting rooms on top of Central Block 3. The first expansion was completed in 1992. In accordance with the Master Plan, the Agency proceeded to design and construct six acres of gardens and two cultural buildings on Central Block 2 which opened in October, 1993 and the Children's Center on CB-3. This Center includes a child care center, an ice rink, bowling center and an arts and technology center for children and youth called Zeum, the historic Playland-at-the-Beach carousel and a two-acre interactive play garden. These facilities complete the public amenities to be built on CB-2 and 3. Millennium Partners/WDG Companies opened Metreon, an entertainment/retail center on Central Block 2 in June 1999. The Agency also has an agreement with Millennium Partners/ WDG Companies to build the retail shops in the Marriott Hotel and a public walkway from Market to Mission Street on Central Block 1. In addition, this developer built the 750,000 square foot Four Seasons Hotel and Tower on the site facing on Market Street on Central Block 1. A 257-unit SRO housing development was completed at Third and Harrison in March 1997. 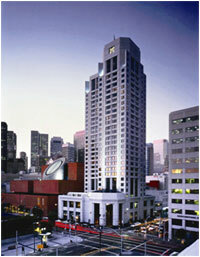 The 425-room W Hotel at Third and Howard Streets opened in May, 1999. Construction of a supermarket and housing development at Fourth and Harrison Streets began in December 1997 and has been completed. Construction of the 500-unit Paramount Residential Tower at the northeast corner of Third and Mission was completed in 2001. Carpenter and Company is the developer of the St. Regis Museum Tower on the southeast corner of Third and Mission Streets. It has been open for several years and includes the 20,000 square foot Museum of the African Diaspora. The Jewish Museum has renovated the Jessie Street Substation for its new museum. Staff is working with The Mexican Museum on the funding and development of their new facility on Central Block 1. In accordance with legal requirements, the Agency continues to manage the security, operation and maintenance program for Yerba Buena Gardens. The Agency also continues to work with Zeum and the Center for the Arts Operating Board for management of their facilities and with a number of citizen committees on the YBC project. These include program committees for each of the children"s facilities, as well as the oversight committee for the entire project, the YBG Policy Advisory Committee.